that might not be their home but one which hold strong ties. 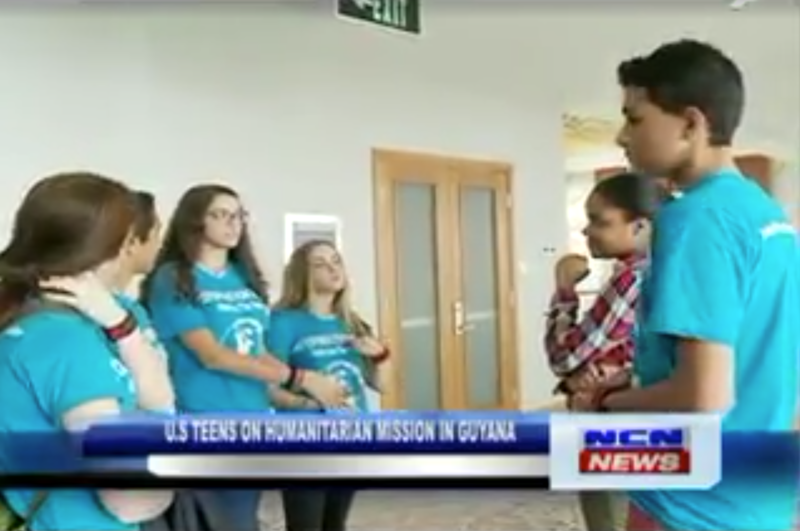 Watching their parents, who are of Guyanese origin but reside in the United States of America, travel to their homeland over the years to give back to impoverished communities and orphanages, 16-year-old Kyle and 13-year-old Brandon wanted to do the same but in a larger way than their parents. The inspiration to do such a thing arose during the Christmas season of 2009 when the family made a trip to Guyana to distribute some goods and educational items to a local orphanage. 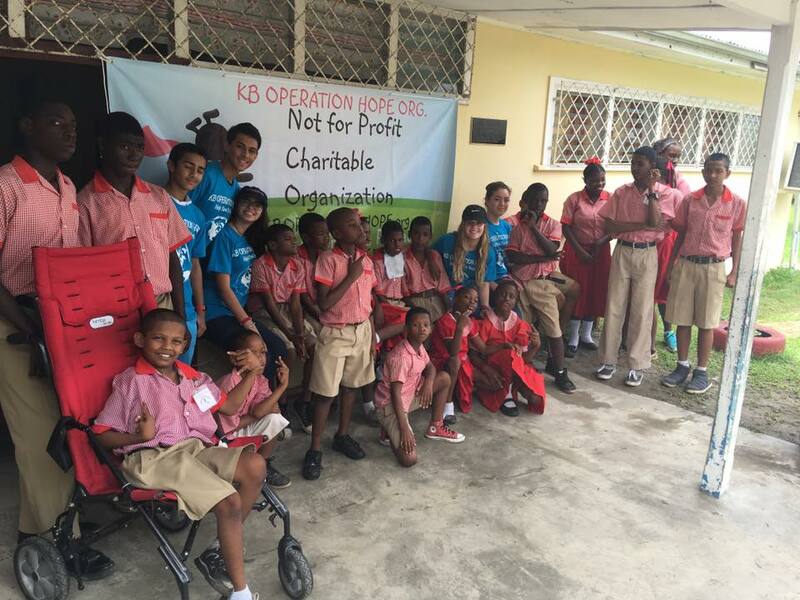 “Kyle and Brandon came along with us to the Orphanage in Gay Park, Berbice and had an opportunity to interact with some of the orphans. However, one child (Jason) shared a story with the boys that changed their lives forever and made them grateful for the fortunes that they have,” said Mrs. Persaud. After that year, the family started making smaller trips to Guyana and other Caribbean islands, where they made donations of school goods and basic healthcare necessities. And their philanthropic desire continued to grow as they interacted with children from all walks of life. It was not long until the brothers grew into the habit of giving. In the year 2013, with the guidance of their parents, Kyle and Brandon took a step to actualize their dream by launching KB Operation Hope, a Not For Profit organisation registered with the New York Department of State that was established on the firm belief that children are the future, and with proper care, resources, and attention, they ensure a greater tomorrow, a greater world, and a better future for all. Kyle explained that their organisation provided educational goods and over the counter medical necessities to international poverty stricken children. KB Operation Hope also helps children through times of crisis, such as natural disaster and international disease expansions. Their mission, he said, is to help provide children with a better life, empowering them as young individuals, giving them knowledge to better themselves, allowing confidence, pride and hope to flourish. 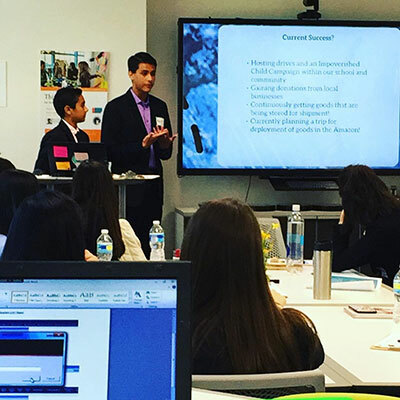 In its initial stages, after gaining donations from businesses, the organisation hosted drives and an impoverished child campaign within schools and communities within the US. However, their vision did not stop there, given that with donations received, KB visits struggling international villages and orphanages giving educational needs such as workbooks, pens, pencils, teaching kits, crayons, textbooks, paper and so forth, allowing the educational prosperity of a child. They also aim to provide medical welfare for international poverty-stricken children and bring OTC medical necessities to villages, such as gauze, wipes, common medical applicants and medication, bottles, formula, diapers, just to list a few. Together, the brothers have rallied volunteers from their school, Knox School, St. James, New York, who also spread awareness of the importance of education and try to speak with government officials and give knowledge on how to change the path of poverty throughout their nation. In their approaches and attempts to do better, given that Brandon is still fairly young, Kyle has stepped to the fore and became the president of his Model United Nations (UN) organisation as well as an active member of his student government for an ongoing three years. He has been on High Honor Society throughout his duration of school, allowing him to become secretary of his National Honor Society. Kyle is an active member of his community, who holds a deep passion and drive for helping children locally and internationally. Often times, he said he would question children’s resources, learning about the hardships that they have to face on a daily basis. The young philanthropist is also a part of a diversity team, which allows more cultural diffusion to take place. His aim is to make differences that positively affected lifestyles. He has created a Civil Rights Alliance Organisation and UNICEF Club within his school as well. He is also an ambassador for the school and pursues an acting career as a hobby. Meanwhile, not to be forgotten, along with his brother Kyle, Brandon has also faced poverty from a first-witness standpoint on his adventures to Third World countries and learning the history of his parents’ home country. Brandon believes in the same motive that children are the future and that by ensuring their proper developmental care and love, they can change the future for better. With that motive in their minds and the desire to give back, the youngsters said that given that Guyana is where their inspiration was fostered, they intend to give back immensely to the youths and less fortunate citizens in any way they can. Being here for the past few days, some of the members of KB got an opportunity to meet with Minister of Social Protection, Amna Ally, the US Embassy and other stakeholders who have signaled their intent to help their organisation grow. The members explained that they visited and made donations to several orphanages such as Children of Promise, Kamal’s International Home and another in Berbice. “We spoke to the children, house mothers and other leaders to see what can be developed…we were able to discuss these matters with the minister, so we hope that they can be addressed,” said Kyle. Some of the plans which have been solidified include a room to teach skills to the children of the Orphanage in Berbice; and to provide education necessities to the Kamal home. Other issues such as bullying in the orphanages need to be addressed, therefore, they intend to continue their work and return to Guyana as many times as possible. Additionally, the organisation during the meeting with the embassy, made an arrangement to send goods to Guyana which will be distributed by the Embassy’s officials, to indigenous communities and shelters. Persons interested in donating towards the organisation’s cause can make contact with the founders or members at kboperationhope.org.